'Fluent Mandarin' ( Barry Blyth, R. 2006). Seedling N293-1. TB, height 38" (97 cm), Early to midseason bloom. Standards buff apricot infused rose at midrib; Falls red burgundy, lightens toward edge to color of standards, beards white tipped orange tangerine; pronounced sweet fragrance, purple based foliage. 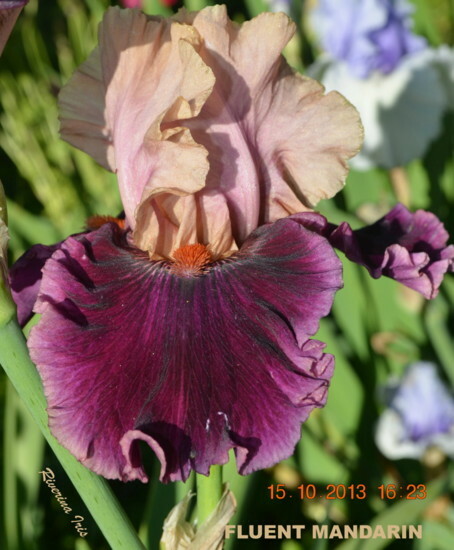 'Cameo Dawn' X 'Fiery Temper'. Tempo Two 2006/07.